Last November, the non-profit Sean Fischel Connect — started to honor the memory of Kim Fischel’s son, Sean, who lost his life in January 2013 after battling hemophagocytic lymphohistiocytosis — held its annual fundraiser the Sean Fischel Connect 5k and 1 Mile Fun Run. 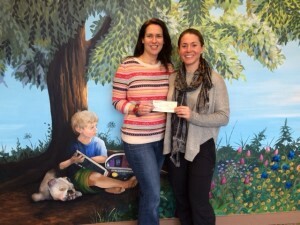 From that run, the Moorestown Library received its biggest donation yet from Sean Fischel Connect, a whopping $10,000. “It was an easy decision to come here again … Being able to put that (money fundraised) back into the community in such visual ways is just extremely rewarding. I was giddy coming in here to give the check,” Fischel said. Sean Fischel Connect started its connection with the Moorestown Library even before its annual run. 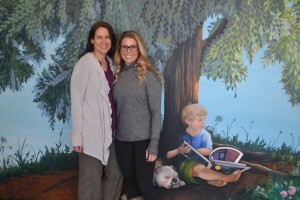 A caring parent from the community approached Children’s Librarian Jennifer Dunne and Fischel about having a book nook in honor of Sean’s memory where people could donate children’s books to the library. From that one “ratty little bookcase” in the old library, a connection was born. “I wanted to do something with Moorestown, but didn’t know where or how to get started … That is the beautiful thing; it came up organically … Since that relationship was established, after our first run, we were so overwhelmed with support from the community that we were able to donate significantly more (to the library),” Fischel said. Since then, Sean Fischel Connect’s donations made it possible to have a Children’s Room with a mural in Sean’s honor, an indoor playhouse called Sean’s Shed, a better book nook for Sean’s donated books, quarterly programs for children and a 1,000 books before kindergarten initiative, all at the new library. “It went way beyond our wildest dreams. To see everything come together with the help of Sean Fischel Connect was just amazing,” Dunne said. With this new donation, the Moorestown Library will be able to purchase a new bookcase to double the size of Sean’s Book Nook, which has outgrown its original space. Additionally, the community will be provided with new programming initiatives such as Science Saturdays with the Franklin Institute and a new summer math program, Bedtime Math’s Summer of Numbers. “We’re very pleased to add those programs because of Sean Fischel Connect, and there will be lots more too,” Dunne said. In total, Sean Fischel Connect donated $60,000 to local organizations from its annual 5k and 1 Mile Fun Run last year. The other organizations that received donations were Dr. Edward Behrens from the Children’s Hospital of Philadelphia for his research with HLH for $25,000, the Moorestown Department of Parks and Recreation for $20,000, and the Moorestown High School cross country team for $5,000. “It’s been so rewarding giving back and everyone remembering Sean. It feels great to help other children, either with fun and enlightening experiences here at the library, expanding the special needs programs at the recreation center or at CHOP eventually and hopefully saving lives,” Fischel said. To learn more about Sean Fischel Connect, visit www.seanfischelconnect.org. To see the programing available at the Moorestown Library, visit www.moorestown.lib.nj.us.